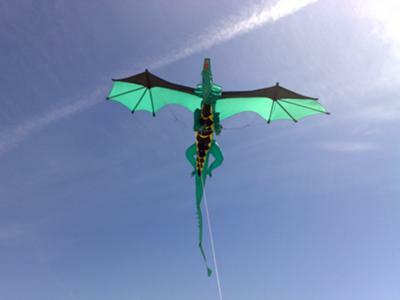 This 23 ft dragon kite took me about 4 months to design and make and over 30 hrs to sew it. I have shown it in the past at Weymouth and Bristol kite festivals. Hope you like it! Many thanks for all of your great comments on my dragon kite. Am now finishing off a devil kite of similar size. My LARP (Live Action Role-Playing) group and I would like a dragon kite for ambience. I remember my brother making a non-dragon kite out of something that resembles tin foil, but was much lighter. Do you know what that might be? It looks impossible to make! I've spent hours trying to make a kite and ended with a small white kite that barely even soars five feet. I wish I could make a kite like that. Thanks for all your nice comments about my Dragon. I took it to the Bristol International Kite Festival on 4th Sept this year 2011 and flew it with the other public who had kites. They loved it and were filming and taking pics of it. It looks so nice in the picture. When actually fly that moment is different, full of happiness. hi! how nice ur kite is! i wish i can learn it too! I like it a lot. How much are you selling a replica if so? I was like what the hell my gosh that is the most coolest kite ive eva seen in my life man that is so cool. Must of been a big challenge that is awesome. Your kite looks great. Imagine that as a twin line stunt kite. Would look pretty cool diving left and right. Man that is one awesome kite. I never had saw kite that BIG it is real neat! excellent! I wish to have one.